What is Comfort Fit Wedding Band? 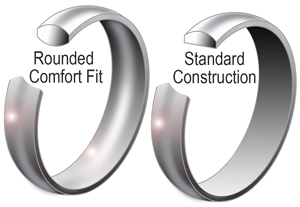 Comfort fit rings are specifically: rings that have a rounded interior for a more comfortable fit, as opposed to the flat interior of standard fit rings. As a result a comfort fit tungsten ring or comfort fit tungsten wedding band is going to feel slightly larger than its size equivalent in standard fit. This difference in feel is due to the sizing of comfort fit rings being taken from the peak of the rounded interior, with the outer edges of the ring tapering out to a slightly large size on either end. Standard fit rings have a uniform sizing from one side to the other (Note: this can cause incorrect sizing at many local jewelers. Comfort fit rings must have the size read from the middle of the band on a mandrel, the sizing tool used for rings. While standard fit sizing is read on the mandrel from the bottom of the ring. This is important because if done incorrectly, the size of your ring can be off by a whole to half size.). Comfort Fit Tungsten Wedding Bands are currently the most preferred wedding bands, especially for men. They are designed with a rounded interior so they slide on easier, don't pinch, and sit on your finger more comfortably. Comfort Fit bands are definitely more luxurious and comfortable for people that are not used to wearing rings (like most men). They are also good for people who have to frequently take off there wedding band, since removal is not as difficult with comfort fit. Due to Comfort Fit wedding bands being thicker from center of the band's interior to its outer edges, they have more metal content than standard rings. Regular "standard construction" rings don't have the luxurious feel of a Comfort Fit band. For all of these reasons it is obvious why Comfort Fit rings are the most popular wedding bands. TungstenWorld.com only sells the best quality, designer tungsten wedding bands, all are Comfort Fit. Important Sizing Note about our Tungsten Rings: Our Tungsten rings are heavy and Comfort Fit, and because there is less contact with your finger we reccomend ordering a half size down from what you were originally sized with. Please call us if you have any questions.